What does Frigidaire refrigerator showing SY CE mean? 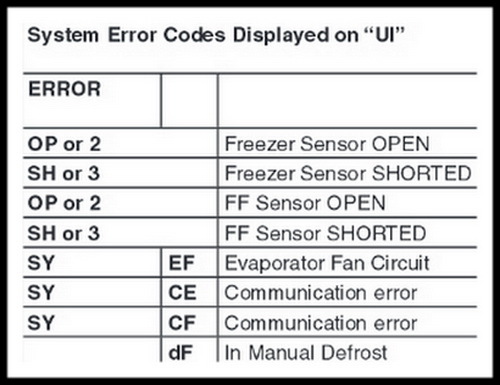 When your Frigidaire refrigerator displays the SY CE error code, this means there is a communications issue. This communication problem is caused by either a wiring issue, wire harness issue, faulty control board, or a bad user interface board. Below we will show how to troubleshoot the SY CE error code on a Frigidaire refrigerator. NOTE: The Frigidaire error code SY CE may look or be determined to be 5Y CE. Frigidaire refrigerator Error Code SY CE: Communication error during powering up. – This error indicates a problem with wiring to and from the main control board and the user interface board. – Error can also mean the main control board or user interface board (display board) is defective or faulty. – Check the wires/wiring on the main control board. – Check to be sure wires/wiring is secure on the board and not damaged. – Visually check the main control board for signs of burns/melted areas. – Disconnect all wires on main control board and plug back in. – Check the wires/wiring on the user interface display panel/board. – Check to be sure wires/wiring is secure on the interface and not damaged. – Visually check the user interface board for signs of burns/melted areas. – Disconnect all wires on user interface display panel/board and plug back in. Need the Frigidaire Refrigerator Tech Manual? Download the Frigidaire Refrigerator Technical Manual & Electrical Schematics Guide here. Note, opens in new window as a PDF file. After checking user interface board, main control board, wiring/wires, disconnecting and reconnecting of wiring, if no obvious signs of a problem are found, plug the refrigerator back in to see if possibly a wire connection or wire harness was not fully secure. If the refrigerator runs properly and does not show the SY CE error code, then a wire connection or wire harness was loose and securing the wire has fixed the issue. If there are no obvious signs of a problem with the wiring connections, wire harnesses, user interface board, and main control board, you will need to test to be sure the wiring is not damaged by using a meter. Check the wires for continuity. If all wires to and from the boards have continuity, then you will know one of the boards are faulty. If any wire harness does not show continuity, replace the wire harness. If all other means of troubleshooting are used and the refrigerator still shows the SY CE error, the technical manual recommends to first replace the main control board. Replace the main control board and test the refrigerator. If the error code clears, the issue was a faulty main board. If after replacing the main control board the error code does not clear, the tech manual recommends to next replace the user interface board. Replace the user interface board and test refrigerator. If the error code clears, the issue was a faulty user interface board. 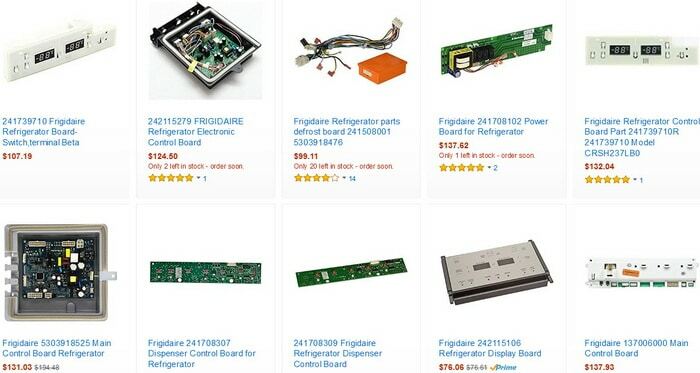 HINT: If you find that the main control board is faulty, it has been known that a new control board is not able to communicate properly with the older interface display board. We suggest to replace BOTH BOARDS at the same time of install to ensure no other communication issues occur. This is because the newer main control boards are revised and do not properly communicate with the display board on the freezer door. NOTE: Be sure you unplug the refrigerator before checking the refrigerator wiring. If you need to perform a live voltage check, please remember to wear safety gloves and safety goggles for your protection. My Gallery model was displaying the SY CE code. I unplugged it for the 15 minutes. And now the display is totally blank. The lights inside the refrigerator compartment have been on and off for a few days. Now off completely. Freezer side is still lit up. Unpluuged/replugged a few times no change. Luckily the unit is still running and keeping things cold as they should be. Had this issue, checked control board behind kick-plate, found a capacitor swollen on top! Replaced it and now everything is back to normal! Many people buy a new board, what a waste of money! Hey David… having this code on my fridge now… what model do you have? Frigidaire Professional FPHC2399KF1?? I haven’t checked the back of the fridge yet.. replaced the control board and replacement from Frigidaire didn’t even turn the damn thing on… I’m at a loss and the SY CE code still there.